ORLANDO, FL (KTRK) -- The parents of a Nebraska toddler killed by an alligator at Walt Disney World say they're devastated by the loss of their son, whose death prompted the entertainment giant to add gator warnings at the resort. A statement by Matt and Melissa Graves of Omaha, Nebraska, said words can't express the shock and grief their family is enduring. "We are devastated and ask for privacy during this extremely difficult time," said the statement, released by a family friend Thursday. The brief statement also thanked authorities in Orlando, Florida, for their assistance after the gator grabbed 2-year-old Lane Graves from shallow water in a lake at a Disney hotel Tuesday. An animal described as being as long as 7 feet snatched the little boy as he waded in shallow water around nightfall Tuesday. The beach, located at Disney's Grand Floridian Resort and Spa across a lake from the Magic Kingdom, had "no swimming" signs but no warning about alligators. On Friday, the company added gator warning signs and workers could be seen erecting a temporary fence. "We are installing signage and temporary barriers at our resort beach locations and are working on permanent, long-term solutions at our beaches," said Jacquee Wahler, Vice President, Walt Disney World Resort. "We continue to evaluate processes and procedures for our entire property, and, as part of this, we are reinforcing training with our Cast for reporting sightings and interactions with wildlife and are expanding our communication to Guests on this topic. 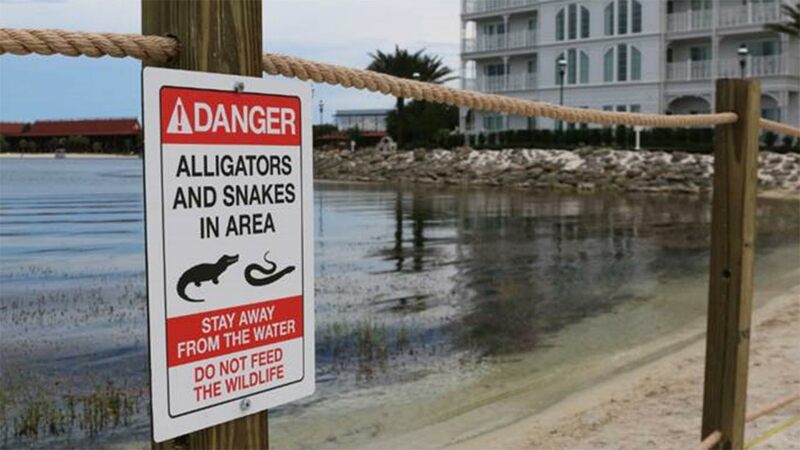 While it's an unwritten rule for Florida residents to keep small children away from ponds and lakes in a state with an alligator population estimated at more than 1 million, many out-of-state visitors aren't aware of threat posed by the reptiles. Depending on the size of an alligator, the state may send out a trapper, as happened after the gator grabbed the boy at Disney's Seven Seas Lagoon. Officials said five alligators were removed from the lake during the search for the child, whose body was found in the water Wednesday.